One of the best ways to deepen your understanding of where you live is to learn the stories behind the names of prominent streets in your community. Drivers whizzing along U.S. Highway 395/580 through Reno, for instance, may not realize how much of the city’s history is written on those green and white exit signs. Just south of Interstate 80,Glendale Avenue takes its name from an early settlement located where East McCarran Boulevard meets the Truckee River. Originally a simple ferry crossing, the community later took on the name of the Glen Dale house, a hotel that opened there in 1866. Mill Street follows the route of a small country lane that led to the Eastman mill, a saw mill constructed in 1861 near the current site of the Grand Sierra Resort. Plumb Lane, Kietzke Lane, and the Damonte Ranch Parkway all were named for early immigrant ranching families. The Plumbs, originally from England, owned land near the current intersection of Plumb Lane and Hunter Lake Drive. The Kietzkes hailed from Germany, while Louis Damonte, a native of Italy, established his family ranch further south on Old Virginia Road. Virginia Street, of course, indicates the route to Virginia City. Moana Springs has been a popular recreational destination for more than a century, in its various forms. 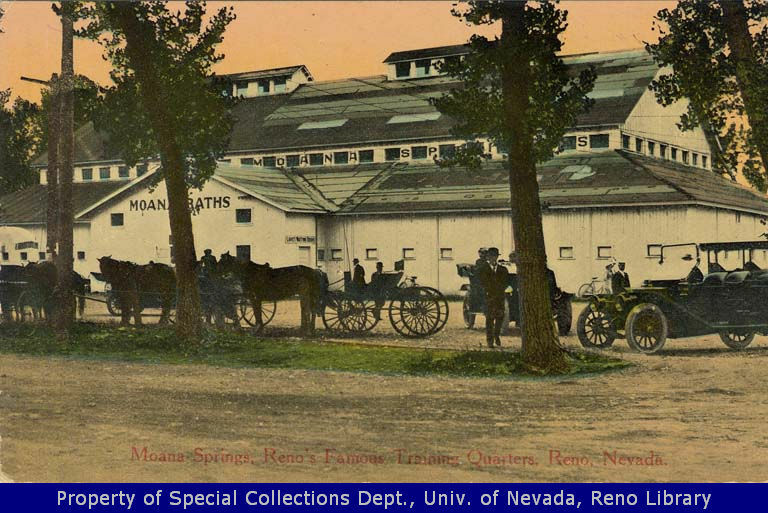 Moana Lane takes its name from Moana Springs, a resort that opened three miles south of Reno in 1905 and was itself named after a famous Hawaiian spa (“Moana” means “ocean” in Hawaiian). Residents flocked to the hot spring-fed pool, bath house, hotel, baseball diamond, man-made lake, and clubhouse. The buildings were demolished by the city in 1956 in order to construct a modern recreational facility. Until 2004, the Neil Road exit was known as Del Monte Lane, named for the Rancho Del Monte, a dude ranch catering to the divorce trade. Its historic ranch house burned down in 1947, killing a divorcee who refused to evacuate naked. So the next time you’re stuck in traffic, don’t despair; entertain your friends with a little highway history trivia. 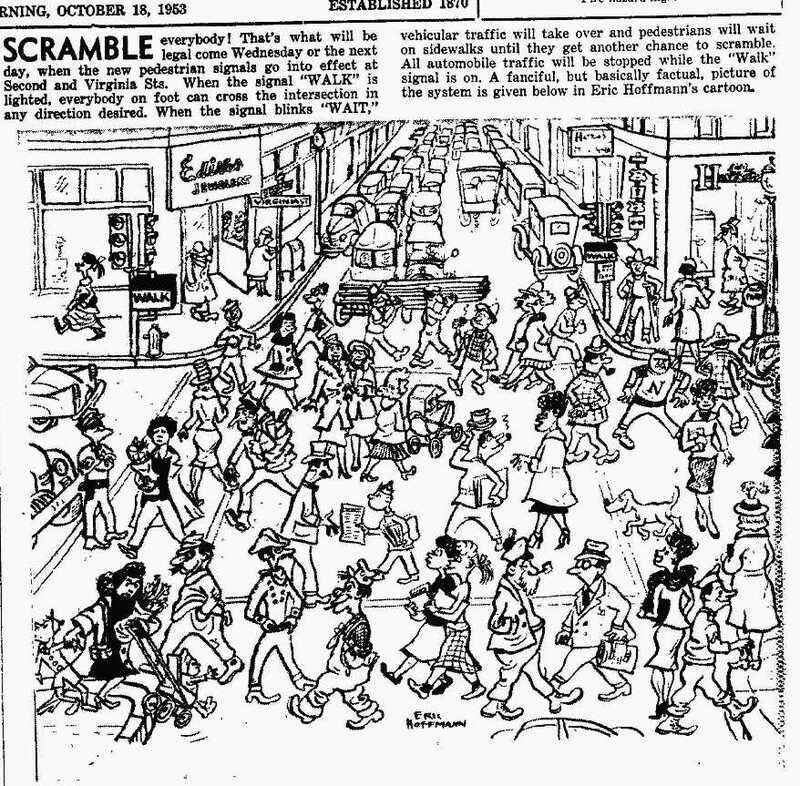 I’m loving this 1953 cartoon from the Nevada State Journal introducing the new “scramble” system at the corner of 2nd & Virginia Street in Reno. The intersection was deemed Reno’s busiest at the time, and the artist has so clearly captured the vibrant pedestrian life of mid-century downtown. Students, stroller-pushing mothers, businessmen, shoppers, workers, cowboys, couples, soldiers–all sharing the streets in a democratic swirl of energy. As we strive to bring vitality & walkability to our downtown spaces, let’s not neglect the lessons we can learn from traveling the streets of the past.